IDEAS NEED VISUALISING – WHY STUDENTS NEED IPADS! What does this mean for iPads in Schools? Are you thinking, what I’m thinking? Yes, that’s exactly what the iPad brings to learning and why it will be successful in schools. The last 3 of those 5 are all about visualising ideas and immersing oneself in a concept using multiple senses. This is not only where extra engagement comes from but also true understanding (never forgetting). It’s important that students visualise their understandings, both for their own development but to also aide their peers and gain a sense that what they are doing is for the better of others. It is this that develops real drive to learn, it does not just add ‘play’ to the learning environment. ANIMATION CREATOR HD ($4) : This app offers a great new way for students to prove understanding in an entertaining way that other students will in-turn learn from. Easy frame by frame animation that some student really like to beaver away at at the back of a classroom. I’ve see some stunning examples! iMotionHD Stop-Frame animation Filming with “Auto-wait” shoot setting. This is the most instant fun I’ve had with my iPad in 2 years! It’s a free app and really simple to use. You set the number of seconds gap between photos and then make slight movements of the objects in front of the iPad’s camera to create instant animations. 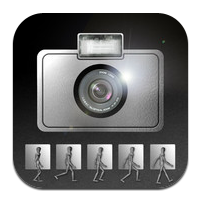 It also has a manual mode for taking the frame shots one-at-a-time. It is simply brilliant! It could be used to comically or otherwise cover any topic and show you understand the process (great for Science) or story so you should be able to use this in any subject! Here is an excellent example from the TED Ed site, where a normal teacher’s lesson is given to a professional Animator. The result is stunning. This professional connection might change education but your own classroom versions will be of equal importance. P.S Why does the title mention Scientists? I feel a major part of the Scientific process is the final depiction of the process / concept / new understanding and this requires an understanding of how people think visually. The use of colour & shape, the position of key objects within a frame at any one moment, the direction of cameras & direction of film sequence determine whether a scientific idea is ever understood and passed around the world. This makes learning the visual arts as important for science students as for any. It is a commonly neglected part of the scientific industry and certainly in Science Education. iPads in the classroom can start to readdress this imbalance.